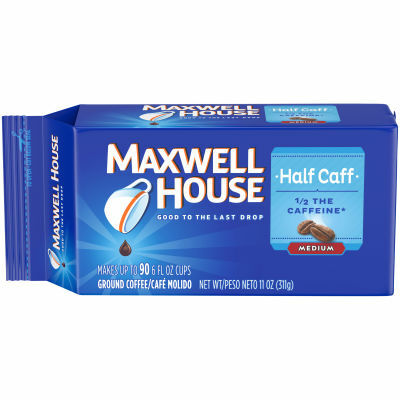 Lite Ground Coffee Experience the rich and balanced taste of a medium brew Maxwell House coffee, with half the caffeine. This coffee is made from 100% pure Arabica beans to give you a deliciously rich taste and flavorful aroma in every sip. Good to the Last Drop This medium roast ground coffee is packed into an 11 oz. bag to retain its freshness and flavor. Perfect for use in all coffee makers, this package makes up to 90 cups of coffee that can be enjoyed morning or evening.